There are just 2 towers left to scale before we enter the prestigious all-European League of Legends slugfest that is the EU Masters 2019. 9 UKLC teams will contest, 4 will make playoffs, but only 2 can go. Megalodontus asks in this in-depth opinion piece for Esports News UK: Is the EU Masters coming home? And if so, with whom? Let’s wave our wands and journey on to Hogwa- nevermind, wrong place. London beckons! Historically, the UK’s finest have not made a great impact in the EU Masters. Summer 2018 was particularly poor, with Enclave Gaming missing out on play-ins and the former UK Forge of Champions winners Misfits Academy flailing helplessly in groups. One could say they played their Brexit cards rather quaintly. Should the the same sequence of events happen again, Her Majesty would most certainly be quite irate. 2 towers remain now, menacingly looming and barricading the way to playoffs. 5 contestants rise, accepting the challenge for a chance to redeem the British circuit. The top team in the UKLC will progress straight to the EU Masters group stage, while the runners-up will compete in a play-in stage with other second-place teams from other European Regional Leagues (ERLs). So without further ado, let’s take a quick look at the current standings and the teams with a chance at making EU Masters. Ah yes, Fnatic. One of the most storied brands in esports worldwide. To be at Fnatic is to be the best. In their decorated halls of endless trophies, titles and awards reverberates a resounding challenge to constantly struggle and strive in pursuit of immortalisation. Their foray into the UKLC has yielded a decent bounty thus far, a boon in their goal to conquer the EU Masters. 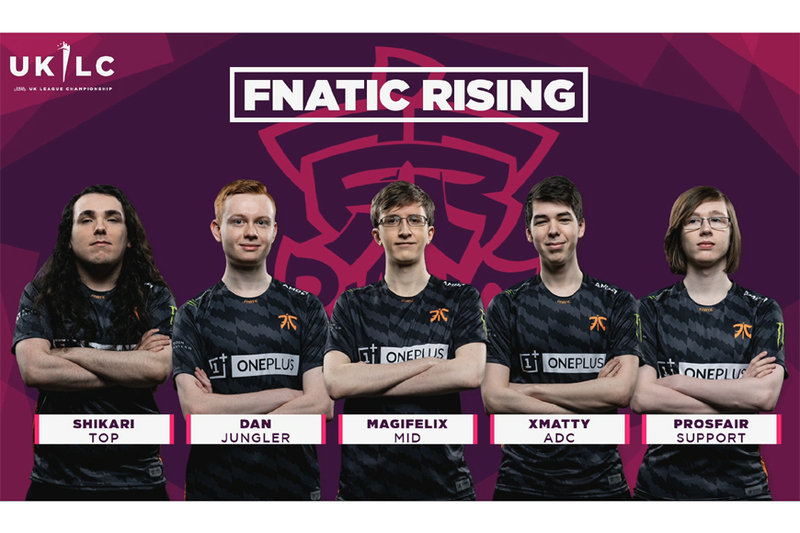 Sitting prettily at the top while being tied with Diabolus Esports, Fnatic Rising are among the favourites to rule Britain. The question is, will they? A star studded roster that needs no introduction, every player they have is arguably top 1 or 2 in their respective roles. This roster was made to win. From top to bot (hi Maxlore) every single position shouts experience and danger for their opposition. As a team they are incredibly oppressive. Fnatic Rising utilises slow, controlled pressure to choke their enemies out and force them into making rash plays. They punish mistakes incredibly hard and give no quarter. The tempo and their strong vision game is dictated by jungler Dan and support Prosfair, the former utilising a farm/objective focused jungle style to obtain a huge lead on his opponent, especially on Karthus where he can obtain mind-boggling cs leads. Dan is enabled by the strength of his lanes, all of them almost never losing hard enough to signal him over. Shikari, who is as caster Hiprain described as the “back to back to back” UK champion is never a liability even in a losing matchup. Look to the reliable xMatty to carry later in the game on champions such as Vayne or Sivir, and MagiFelix - or as some call him, MagiFaker - to display his famed mechanics from solo queue (as long as he doesn’t get caught out randomly)! There have been concerns with them adjusting to the new patches of early aggression in some of their performances, but this team has been quick to adapt. Decisive and not flashy, Fnatic get the job done. They are arguably the best counterengage team and one of the best team-fighting teams in the UKLC. Despite their hiccup in Tower 4 due to the change in patches they made a roaring return in Tower 5, almost reclaiming the coveted tower champion spot from Diabolus. Their roster, organisation and infrastructure present too convincing an argument and picturing them out of the running is simply unthinkable. Now, while we expect them to qualify whether they make it as the 1st seed or 2nd, that is the real question. Diabolus Esports, with their fiendishly well designed logo, are picking up where they left off: reaching for the summit. Coming painfully close to defeating Misfits Academy in the Grand Finals last year, they missed out on going to the EU Masters. It was good lesson, and they wear this battlescar proudly, symbolising their progress. This burning mark reminds them of what they stand for: to give their enemies hell. 2019 is no exception. Securing the services of very strong talent all round, Diabolus aim to once again set rainy Britannia alight. As Tower 6 approaches, Diabolus fiendishly plots the demise of their foes atop a fiery throne (which is located in Manchester, funnily enough). All who face them take heed… when you make a deal with the devil, the devil usually wins. Acquiring a roster of veterans along with relative newcomer ADC Yusa, their journey to once again defy the odds begins anew. Many worried in the early weeks this team was too linear in their approach, which generally consisted of fighting a lot and putting Yusa on a hyper carry. Casters often referred to this as ‘The Yusa show’. To the loyal followers of their mascot Diabobro, fret not. Every week has only seen the nefarious battalion ascend in unholy fervor. With the recent patches, Diabolus might have hit the jackpot. Kerberos, who is sheer terror incarnate in the late game, benefits from playing a range of champions in the top lane, including mages, tanks and carries. His Yorick for example, dismantled MnM in Tower 4 and Fnatic in Tower 5. Control mages in mid lane enable the solid rock that is Kroghsen, while jungle champions like Rek’Sai or Jarvan allow jungler Munckizz to thoroughly dispel his ‘tank-only’ tag. Yusa undoubtedly still benefits greatly from the changes to marksmen with the ever-vigilant and experienced support player Hadow beside him. This means Diabolus has threats in every position at their disposal. As a team they play a relatively calm early game. Come mid to late game however, all hell breaks loose (literally). Diabolus loves to scrap and fight. They possess some of the best teamfighting abilities in the UKLC, and these brazen daredevils fear none even if they are behind. All well and good for this flamboyant roster. That being said, they tend to make very obvious mistakes. Kerberos getting greedy and dying early on - sometimes more than once - is a big one. Their over-aggression also cost them early on in the UKLC. If they can temper their zealous approach and eliminate their weaknesses, Diabolus will witness their competitors fall before their wrath, burnt to a cinder. Assuming the current meta and patches stay the same, Diabolus will continue to challenge Fnatic Rising for the first place till the bitter end. A bold statement? The table says otherwise. They are currently tied for first at 14 points with Fnatic, defending their crown from Tower 4. Should they keep this run of form, the prospect of competing in the continent will no longer remain a dream of brimstone and hellfire. Excel are a brand on the rise, only made more powerful with their inclusion into the LEC. UKLC caster Aux played for them in 2017 where Excel won the ESL Premiership title along with current players Taxer and Innaxe. Despite always being a threat in recent times, they’ve never quite dominated the scene, even failing to qualify for the EU Master Summer 2018. In honour of their entry into the LEC, Excel UK assembled a mighty squad in their home base of Twickenham Stadium. Some predicted that on paper they have the strongest roster in the British Isles. Despite inconsistent showings thus far, their aim is very clear: thrive together, overtake Fnatic and rule Britannia, not just ‘excel’. Excel UK are done playing second fiddle. The limelight, they decided, should be theirs to hog. They have put together a squad occupied by burgeoning talent along with returning players Taxer, Sendoo and Innaxe. The core strength of Excel is their philosophy of the ‘10 men roster’ whereby they view both their LEC main team and their academy as one big team. While there are rules in place which prevents a full 5-man roster change, the option to swap players in between weeks is a powerful and flexible tool. Exile, traditionally known as the ‘10/0 or 0/10 player’ has been on a tear, destroying Barrage in Tower 5 with a 9/0/3 score on Ryze. His surprising consistency is welcoming as Excel are a very volatile team. Often playing a controlled game for the first 15 minutes before they start to force multiple fights around the map, they rely a lot on the skills of their individual players to see them through. Caster Aux describes them as a team that “plays on a knife’s edge”. Innaxe (the dog god) and Mystiques make the case for one of the strongest bot lanes in the league, with Thresh being a must ban against the Polish support. Just ask Fnatic Rising in Tower 1 where he landed a game changing hook. Flashy top laner Sendoo has had admittedly inconsistent performances and welcomes the shift in champion picks, and so will jungler Taxer who aims to be proactive early on. Concerns circulate around the true strength of their 10-player rotation strategy, and if the roster will have trouble achieving peak synergy. Nevertheless, Excel are a fearless team. They will drag you down and beat you senseless should they smell weakness. Despite being the champions of Tower 1, they’ve had relatively poor showings after. Tower 3 and 4 saw them exit in the first round while Tower 5 wasn’t much better, losing to rivals Fnatic in the second round. Subbing in famed UK support KaSing didn’t help break this trend either. Sitting at 9 points, Excel UK still present a solid case for qualification. Excel have the talent and infrastructure behind them, they need only a bit more consistency and to keep believing in their process to move forward. Like Excel, MnM Gaming are another one of the old boys in the British circuit, stretching back to 2014. Their incursions in last year’s Forge of Champions however didn’t go so well, like marshmallows held far too long over an open flame. Burnt and forgotten. Change was needed for the ninja marshmallows. Thus far, their efforts have borne fruit. The proverbial flame they use in their motto to signal their drive has recently ignited into an inferno, rendering their will into tangible results. With a spot in playoffs alluringly dangled before them, the gelatinous shinobis are desperate to clinch it. Will their shurikens consistently find the mark? MnM have opted to build a roster of veterans along with young rookie midlaner Chibs. With experienced ADC Monk on the roster, MnM tend to veer heavily towards the strategy of “Monk will carry!”. His Kog’Maw game against Excel UK in Tower 3 for example, where he said: "In the Kog'Maw game, I knew we were going to win from the draft no matter what, that's just how I feel when I play Kog." Yet there are times MnM have to witness a “Monk will feed” match, his Veigar pick against Fnatic Rising in Tower 3 going 0/6/4 is an obvious blemish, the stalwart support in Shogun often left helpless in those moments. Generally, MnM play a controlled early game with the only element of aggression being jungler Noltey, preferring the slow and steady approach and focused on scaling till late. Noltey has had up and down performances but is complemented by the strength and reliability of his solo lanes: Mumus in top and Chibs in mid. Top laner Mumus is reliable on tanks or carries and his versatility cannot be understated; Chibs has surprised everyone, being the rookie on the team but showing consistent performances thus far, especially on Irelia and Lissandra. As a team they have no lack of individual talent, with obvious threats in all positions. MnM still stand as one of the better team-fighting sides in the UKLC, grouping often and letting Monk display his ninjutsu. MnM still have trouble finding a style consistently from match to match, though their improvement has been steady. They now stand at the crossroads: refine one style and flourish, or continue the experimental approach in hopes the team becomes versatile in time? As they sit in a circle mulling over their browning blobs of sugar and gelatin, only they know the right formula for that perfect roast. They’ve proven they are good enough to go far but never all the way. Reaching the finals in Tower 3 and 5 but falling both times to Fnatic Rising, and failing to hold Tower 4 to rivals Diabolus Esports. MnM also had a spirited yet ultimately disappointing run back in the old EU Challenger Series Qualifiers. MnM currently have 10 points in the UKLC, just 1 point above Excel UK, but their schedule for Tower 6 is very tricky as they will have to face either Fnatic or Diabolus in Round 1. Enclave Gaming? Make playoffs with 3 points? Surely you jest? Domestically Enclave Gaming are a very familiar name. No stranger to being near the top of the British circuit and even making it to the EU Masters play-ins twice, like the valiant knights in Enclave’s illustrations they do not fear a challenge. No one knows really what to expect from them in 2019. Their roster is an odd mix and they shown flashes of brilliance but never consistently. Yet the potential is definitely there. If any team were to charge in the top 4 in the final hour, it would be Enclave. Enclave’s roster is a puzzling entity. Other than jungler Wysek, the rest of the team are quite inexperienced, with support Raizins coming out of retirement. As a team, Enclave operate on the philosophy of ‘the whole is greater than the sum of its parts’. Individually they are not as strong as the top teams, however they make up for it through creativity and teamwork. Enclave play differently from the other 4 and are the most proactive team in the early game. The facilitator is Wysek, their jungler who drinks nitro fuel for breakfast. He is very aggressive, ganking and invading constantly. Skudzy from Barrage felt this oppression for nearly 20 minutes when they faced off in Tower 3. Warzi, his Polish compatriot in the mid lane, completes the ruthless mid-jungle duo, especially when he gets Zoe. However the Polish Paladins are not alone. UK top laner Governor has been on the upswing, from being a generally tank-only top laner he now controls a scary Jarvan, solo-killing Artorias and Kerberos in lane. Kehvo and Raizins are a solid duo, Raizins being a much needed facilitator on his hard engage champions and Kehvo, being a former midlaner, possesses the experience to run mages in the bot lane effectively. Enclave’s issues lie in their transition to the mid and late game, where they tend to either take their foot off the pedal and let the opposing team get back in the game, or go way overaggressive too many times courtesy of Wysek/Raizins. Another worrying trend they have displayed is if the mid/jungle duo fails to accrue an early lead, Enclave tend not to succeed. With the most inconsistent team-fighting of the top 5 teams, Enclave have a lot to work to do and they must find their footing quickly or see what remains of their chances slowly slip away without so much as a whimper. Enclave have 3 points. If they don’t win at least 1 tower and one of the current top 4 doesn’t flounder, Enclave stand no chance. But they have beaten Fnatic Rising once before, and if nothing else will use it as impetus to fight for that 1 in a million chance to qualify to playoffs. Time will tell which teams make it. In the meantime, there are just 2 weeks left until playoffs arrive - and the battle to represent the UK in the EU Masters will begin in earnest. Let’s not forget, changes are coming. The British circuit will advance this summer. From split two onward there will be a full season cycle, with a relegation/promotion tournament giving a chance for new teams to enter the league. We can’t wait to see how it all shapes up. 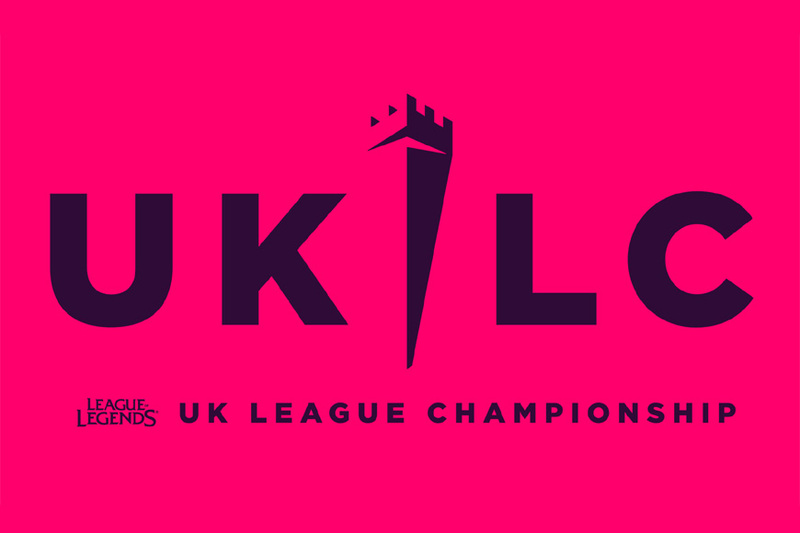 Week 6 UKLC matches get underway tonight (March 20th) and tomorrow (March 21st) from 6pm.